The Geekiest Baby Book Ever. Raising a geek child between the ages of 1-3? Then here's the perfect book: My Little Geek is an alphabet book made entirely of geek references. 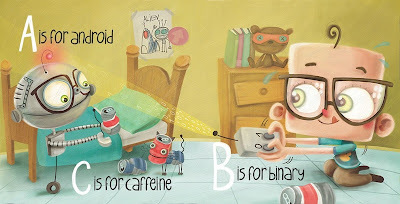 Sure your child might not spell properly when they are older (L is for L33T) but they might commiserate with your need for coffee (C is for Caffeine) and your love of tech (A is for Android) and gaming (J is for Joystick). The Dude, sadly, is too old for this. But maybe someone can get me a copy for Xmas as a fun office decoration?